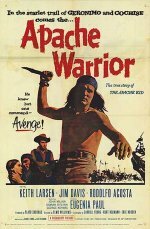 Loosely based on the legend of the Apache Kid, this is a fine low budget entry. Larson (he was Brave Eagle in the TV series) is great as the warrior that is double crossed by the army he aided in bringing in Geronimo. "Big' Jim Davis does well in a role obviously patterned after scout Al Seiber. Considering the cast and crew, this one bears the mark of something Robert L. Lippert had his hand in, as an executive at Fox.